Christmas Day each year, since 1984, has been a major working day for around fifty members of our town's churches, while most people are with their families or away. These volunteers are providing lunch, entertainment and tea to around 100 people who would otherwise be alone on this special day. The guests are mostly elderly, but also include some younger people who have special needs or learning difficulties. Altogether, in 2014, 61 guests were welcomed at the Methodist Church and 43 meals were delivered to those who are housebound. 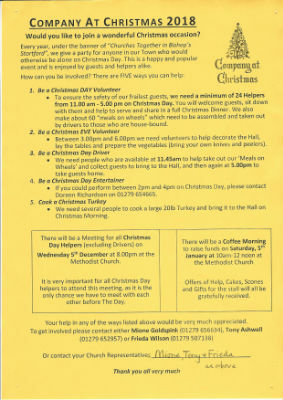 This is a major event which is funded by fundraising activities and donations during the year and it depends, of course, on the church members who give their time and effort to prepare from January onwards to find the money, plan the programme, rehearse the entertainment, order the food, ensure that it is cooked and can be properly served on Christmas Day. We greatly welcome the gifts of food from producers and shops. A great time is had by all, new friendships made, old ones refreshed and the helpers go home happy but tired! .